SERBIA - The annual Arbor Acres® School took place in the Republic of Serbia from 12 to 16 Sept. 2016. Participants from Russia and Kazakhstan, including members of the Arbor Acres 400 and 140 Clubs, shared practical experience and gained useful knowledge during the event. Presentations from the Aviagen® team of customer service representatives, a veterinarian, a nutritionist and a specialist in poultry fertility focused on practical aspects in the different stages of the production process. Students were particularly interested in methods of achieving higher chick numbers per hen housed while improving the overall health and welfare of the birds. 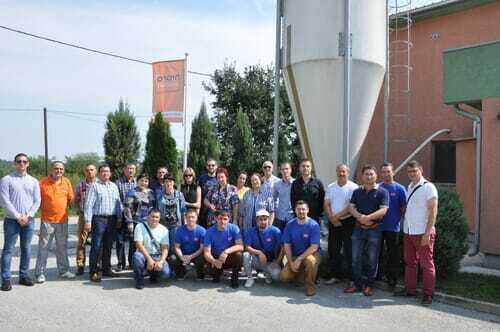 One of the week’s highlights was a visit to a broiler farm, which allowed an exchange of best practices among Serbian colleagues. Arbor Acres Sales Manager in Russia and Kazakhstan, Vladimir Pankratov, said, “Arbor Acres is one of the fastest-growing breeds in the industry and enables our customers to achieve excellent production and economic results. Our company constantly works on product development and improvement. Aviagen is committed to sharing the latest knowledge and offering ongoing education and training to its customers. The Arbor Acres School is one of many educational opportunities extended to Aviagen customers throughout the world.